Halloween is already, at least in part, about free food. You get dressed up and walk door to door in your neighborhood demanding free candy because your parents bought you a Hulk mask. It's a good deal. As you get older, everyone knows you can keep dressing up, but some people forget that the treats don't have to end either. Restaurants all across the United States -- Chipotle, 7-Eleven, Krispy Kreme, and more -- are offering free, cheap, and weird food in honor of the year's best holiday. For most of them, you don't even have to dress up (though, you can and you totally should). Here are all the places where you can dig up free and cheap food in honor of this fine holiday. Oh, and we promise you won't find anything about bobbing for apples in here. 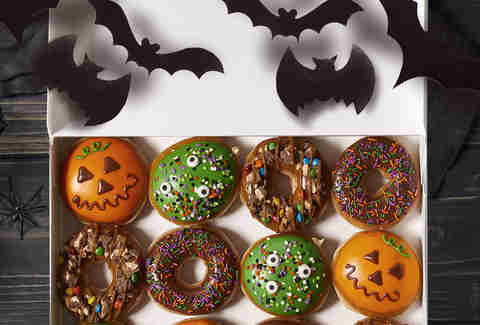 The deal: Stop by Krispy Kreme in your costume, and you'll earn yourself a totally free donut. The deal: Make a $1 donation to the Dave Thomas Foundation for Adoption and get a coupon book with coupons for five free Frostys. The deal: Download the 7Reward app to get a buy-one-get-one-free pizza between 4-10pm local time. The deal: Wear a costume, get a free cookie. Pretty simple. The deal: When you stop in to make syrup bottles sing, know that kids 12 and under get a free Scary Face Pancake from 7am to 10pm on Halloween. The deal: Dress as your favorite Nic Cage character, and you'll get a free soft shell beef taco with any purchase. OK, any costume is fine, but Nic Cage costumes will probably get you a high five. The deal: Place an order on DoorDash starting at 2pm, add the free "spooktacular treat" to your cart, and DoorDash promises a "scary-good surprise." The offer is only available in Atlanta, Austin, Calgary, Chicago, Denver, Washington, DC, Los Angeles, New York, Phoenix, San Francisco, and Toronto. You'll also be able to donate $1 to Feeding America if you're feeling generous. The deal: Show up in costume, and you'll be handed 50 free tickets to get your game adventure going. They call it Chucktober, which isn't important but is amusing. The deal: The pizza shop is running a "Booooogo" deal. All meals are buy-one-get-one-free, but you don't have to say "Boooooogo" when you order because it kind of sounds like booger. The deal: Wear your costume to BurgerFi, and you'll get a free small custard or a free small order of fries. The deal: If an adult buys a meal, kids eat free on Halloween. The deal: Kids who are in costume will get a free meal when their parents but a meal. Additionally, kids get an activity kit with puzzles, games, and stickers. The deal: Text "TRICK" to 91681 and get a coupon for a free pumpkin smoothie when you buy another smoothie. The deal: It's not food, but it is free. Drop in wearing a costume and get a free $10 arcade game play card. The deal: Kids eat free when an adult buys an entrée and beverage. You can get two free kids meals per purchased entrée. The deal: Kids under 12 who are in costume get a free mini pizza when an adult buys a MOD-sized pizza or salad. 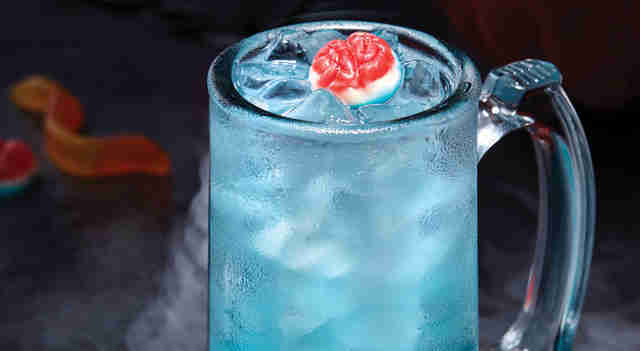 The deal: The home of all sorts of fried appetizers has a zombie cocktail as its cocktail of the month for just a buck. The deal: The burrito chain's BOORITO promo is back. From 3pm to close, anyone in a costume can grab a burrito, bowl, salad, or order of tacos for just $4. The deal: DQ also has deals to get you a cheap Blizzard in the mobile app. You'll find offers for a buy-one-get-one for $0.99 on any size Blizzard. You can also take them up on an offer for a free small Blizzard with the purchase of any regularly-priced combo meal. The deal: Everyone gets $1.50 ice cream scoops, which includes October's flavor of the month, Trick Oreo Treat. 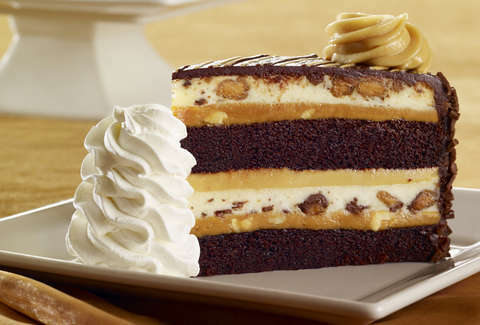 The deal: Belly up for a free slice of Reese's Peanut Butter Chocolate Cake Cheesecake or Hershey's Chocolate Bar Cheesecake through DoorDash when you place an order for at least $30 with the code "TREATORTREAT." The deal: Drop your kid into their costume and head to Sizzler. Any kid in costume gets a free meal when their adult buys an entrée and a beverage. The deal: The bagel chain is calling it a "scary good deal." Grab a big bagel bundle for just $10.31. The deal: The former pizza of the NFL has a jack-o'-lantern pizza for Halloween that's just $11. Papa John's also has a boatload of other Halloween deals for anyone throwing a Halloween party. You can get five large one-topping pizzas for $42.50 with the code "SCARE"; five large one-topping pizzas with three sides or desserts for $55 with the code "GHOST"; five large one-topping pizzas with three sides and three desserts for $70 with the code "FRIGHTFUL"; and one large jack-o'-lantern pizza, five large one-topping pizzas, three sides, and three desserts for $80 with the code "TRICKORTREAT." The deal: Grab six bacon cheese sliders for $6.99 in honor of the last day of October. The deal: The sandwich shop's week of deals for Potbelly Perks members continues on Halloween with a free cookie or ice cream sandwich with the purchase of an entrée salad or sandwich. The deal: Dress your kid up in a costume and they're getting a free pizza buffet with the purchase of an adult buffet. The deal: Get a free order of classic tots with the purchase of any 8-inch sub. The deal: All regular and kids-sized scoops are just $1.50 for Halloween. The deal: In honor of the only holiday where you aren't required to call your parents, Freebirds will give out a free bottle of its death sauce when you buy a monster (or larger) burrito. The deal: Kids in costumes eat free when an adult buys a meal on Halloween. The deal: Bang Bang Shrimp and martinis are just $6 each in honor of your spooky costume. The deal: They're not discounted, but Krispy Kreme is offering four Halloween-themed donuts, including one covered in salted caramel and crushed Halloween candy. The deal: The chain just launched The Nightmare King. The sandwich has a burger, a chicken fillet, bacon, and cheese crammed between two nuclear green buns. BK also claims it can actually increase your chance of nightmares. Happy Halloween. The deal: You can get a jack-o'-lantern-shaped pizza. There are a bunch of offers that include the pumpkin-shaped pizza. Find them all here. The deal: Join the restaurant's Club Baja membership program, and you'll get an offer for a totally free taco, valid for one chicken or carnitas Baja or Americano taco. The deal: Sign up for the rewards program -- Slab Happy Rewards -- and a free ice cream is on the way. If you know of Halloween freebies and deals we missed, email us at news@thrillist.com and we'll add 'em here.